Join us next Friday night, December 5th, for a delicious and uplifting Community Shabbat Dinner to be held at the home of Rabbi Yitzi and Malky Schmukler. Schedule: Kabbalat Shabbat (Welcoming the Shabbat) service at 6:30 pm, dinner at 7:00 pm. Our friends are sometimes surprised to learn that Chabad of the Bay Area is not funded by outside sources, rather it is the grass-roots support from the community we serve and friends and admirers who really make our work possible. As we near the end of 2014, please stay tuned for details about our special upcoming End of the Year Campaign. Your partnership and support at this time is not only a vote of confidence, but vital to enabling our efforts to provide warm, welcoming and innovative programming to Jewish people throughout the Bay Area regardless of background or affiliation. 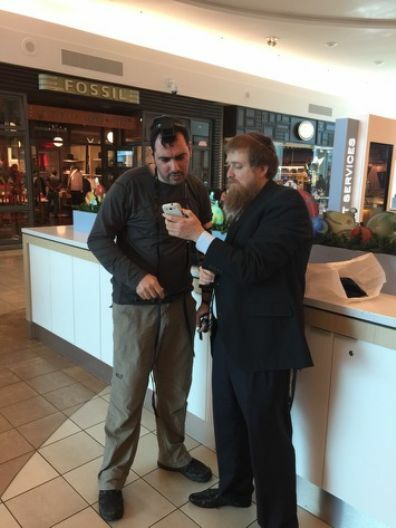 A Jewish man proudly puts on Tefillin and reads the Shema this week at Baybrook Mall. Join a hundred Jewish young professionals in their 20's and 30's for a spectacular Chanukah three hour Boat Cruise departing from South Shore Harbour in League City. Meet, mingle & network as you enjoy a Chanukah Menorah Lighting in Galveston Bay at sunset, drinks, food and loads of fun. PURCHASE YOUR TICKETS TODAY - Boat has limited space and will fill early! Chabad of the Bay Area's high profile Chanukah events bring the joy, celebration and positive message of Chanukah to many people in the Bay Area! Sponsor: $180, $360, $540 or any amount that you'd like to give. We'd like to invite you to partner with us in our upcoming exciting Chanukah events. Chabad of the Bay Area's high profile Chanukah events bring the joy, celebration and positive message of Chanukah to many people in the Bay Area! Contributors of $540 or higher will be recognized on marketing material and at the events. Thank you for helping to spread the joy of Chanukah in the Bay Area! Space is limited - Reserve today! Acclaimed author and rabbi Joseph Telushkin, will be delivering a talk on Sunday, November 9, 7:30 pm, at the JCC about his bestselling book, Rebbe: The Life and Teachings of Menachem M. Schneerson, the Most Influential Rabbi in Modern History. New JLI course off to a great start! The new Jewish Learning Institute course, How Happiness Thinks, got off to a great start this week. With five more classes to go, it's not too late to join in! 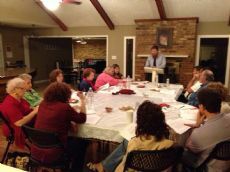 The class is held Tuesdays at 7:30 pm. To register, visit www.MyJLI.com or contact our office.